We are here in New Orleans. 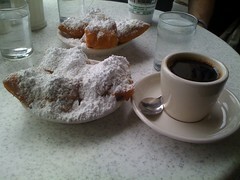 We just came from Cafe Du Monde. Tonight, we're gonna be zombies at the Kiss concert. Woohoo!